5 Parks, Recreation & Cultural Resources VISUAL ARTS Feed your creativity—there's something for everyone! Courses held at the Cary Arts Center unless noted. Calligraphy Modern Calligraphy (age 11–15) Using markers, learn the basic stroke sequences of modern calligraphic lettering. After learning letter forms, use multiple colors for rainbow lettering. Supplies included. 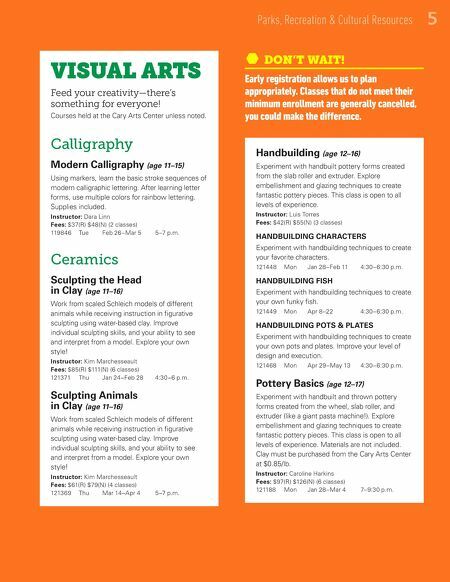 Instructor: Dara Linn Fees: $37(R) $48(N) (2 classes) 119846 Tue Feb 26–Mar 5 5–7 p.m. Ceramics Sculpting the Head in Clay (age 11–16) Work from scaled Schleich models of different animals while receiving instruction in figurative sculpting using water-based clay. Improve individual sculpting skills, and your ability to see and interpret from a model. Explore your own style! Instructor: Kim Marchesseault Fees: $85(R) $111(N) (6 classes) 121371 Thu Jan 24–Feb 28 4:30–6 p.m. Sculpting Animals in Clay (age 11–16) Work from scaled Schleich models of different animals while receiving instruction in figurative sculpting using water-based clay. Improve individual sculpting skills, and your ability to see and interpret from a model. Explore your own style! Instructor: Kim Marchesseault Fees: $61(R) $79(N) (4 classes) 121369 Thu Mar 14–Apr 4 5–7 p.m. Handbuilding (age 12–16) Experiment with handbuilt pottery forms created from the slab roller and extruder. Explore embellishment and glazing techniques to create fantastic pottery pieces. This class is open to all levels of experience. Instructor: Luis Torres Fees: $42(R) $55(N) (3 classes) HANDBUILDING CHARACTERS Experiment with handbuilding techniques to create your favorite characters. 121448 Mon Jan 28–Feb 11 4:30–6:30 p.m. HANDBUILDING FISH Experiment with handbuilding techniques to create your own funky fish. 121449 Mon Apr 8–22 4:30–6:30 p.m. HANDBUILDING POTS & PLATES Experiment with handbuilding techniques to create your own pots and plates. Improve your level of design and execution. 121468 Mon Apr 29–May 13 4:30–6:30 p.m. Pottery Basics (age 12–17) Experiment with handbuilt and thrown pottery forms created from the wheel, slab roller, and extruder (like a giant pasta machine!). Explore embellishment and glazing techniques to create fantastic pottery pieces. This class is open to all levels of experience. Materials are not included. Clay must be purchased from the Cary Arts Center at $0.85/lb. 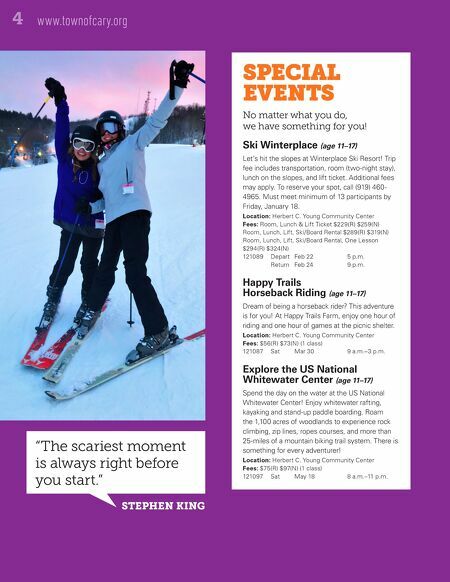 Instructor: Caroline Harkins Fees: $97(R) $126(N) (6 classes) 121188 Mon Jan 28–Mar 4 7–9:30 p.m. ⬣ DON'T WAIT! Early registration allows us to plan appropriately. Classes that do not meet their minimum enrollment are generally cancelled, you could make the difference.